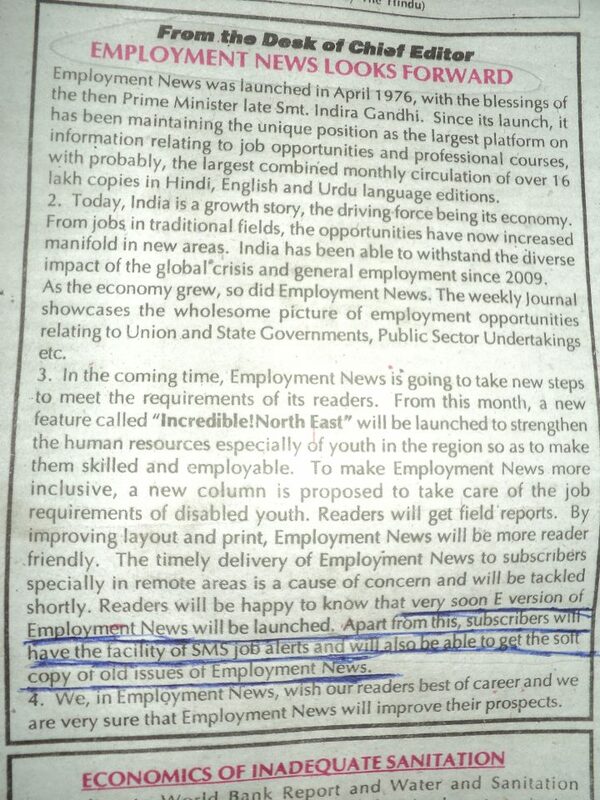 People will buy the Employment News Paper weekly but no one will think that why does not Government put it on their website? Government’s motto is also not to make profit but still why the hell I am wasting 72 pages (and hence cutting so many trees weekly)? People keep saying that you just can’t change the way this public administration is working. Now, Employment news online, thanks to RTI Anonymous !! Now see the way we people at Getup4change changed it..
We started taking pictures of the paper and uploading it every week on our website ( http://getup4change.org/employment/ ). Simultaneously we kept bombarding the various officers, political leaders and ministers with our humble calls and mails. Things went the same way for almost 3 months but we did not give up. But one day they have do it, and they finally agreed to upload an E-copy of employment newspaper on their website and we were able to save thousands of trees per week and also made the information of employment opportunities more reachable.That was indeed Gandhism in true spirit. Yes, we understand that this won’t make that much difference but what if everyone start working on these principles and adding or improving what ever he can in this corrupt system. Yes, things will change and our system will. Thanks to Two RTI Anonymous activists, the government of India will now published the Employment News/Rojgar Samachar Online . The two RTI Anonymous activists Sangh Priya Rahul and Nawal Agrawal had taken this project and had been following up with the concerned authorities. RTI Anonymous is an online service, through which, any Indian citizen can File Right to Information (RTI) Applications Anonymously. They DO NOT HAVE TO REVEAL THEIR IDENTITY. The RTI Anonymous Community will file those RTI Applications in their name and upload the documents obtained as a reply on this website. The original requester will get an email when this happens. The original requester just has to draft the RTI Application as much as he/she can and the RTI Anonymous community will take care of the rest. RTI Anonymous: “One Stop Solution” to Fight Corruption in India !!! A lot of people, wonder — How does RTI Anonymous really work ? How can an Anonymous RTI work? Is it even legal ? 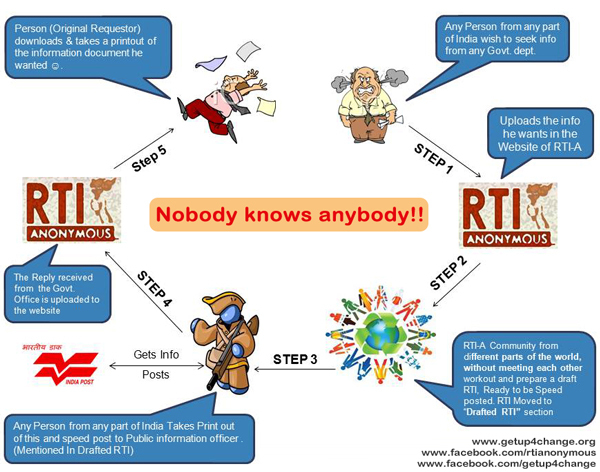 So this page explains in detail, on how it really works ..
RTI Anonymous in its true sense, is NOT Anonymous !!! Its real people filing real RTI. RTI Anonymous is not based anywhere, but based everywhere, there is a wi-fi/internet connection. STEP 1: So person A, who is based in say, Kanpur has a problem with a particular road in his locality and needs to file an RTI Request. He submits a request to RTI Anonymous, with details ofthe Public Information officer and his set of questions. STEP 2: An expert in drafting RTI (in our case, for example, an Ex PIO and retired Registrar from Bangalore or a RTI Activist in Pune ) will draft the RTI. Few other experts in drafting RTI’s, based either in different parts of India or Concerned NRI’s from different parts of the world, review and draft the RTI.The RTI Request is now moved to the Drafted RTI Request Category. If the Experts decide that the request is frivolous or does not need anonymity or just to vague and needs more information, then its moved to its appropriate category (Non RTI, Non-Anonymous RTI orUnclear RTI Category). Step 3: Once drafted, a concerned citizen from say, Chennai takes printout of this drafted RTI and puts in the IPO for the required amount and speed posts it.He then updates the website with the speed post number. The RTI Request is now moved to the Filed RTI’s Category. STEP 4: Once the Chennai guy receives the reply, he just takes a picture of the documents received with his cell phone or digital camera. Uploads it to his computer and then uploads it to the website. At times, he just does a normal post to one of the RTI Anonymous’s Core Team Member and they would then upload these documents to the website. STEP 5: Once uploaded, the original requestor (from Kanpur or wherever) gets an automated email and he can then download the documents that he had recieved. Also any Public Interest Litigation (PIL) lawyers or Journalist/Reporters can also download these documents from this website. The RTI is filed by a guy from say, Chennai. 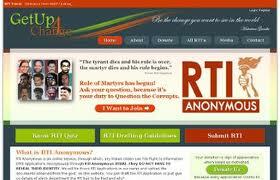 Infact, even the founders of RTI Anonymous, have not met each other personally, yet !! There is no head-office of RTI Anonymous !! RTI-Anonymous does not depend on the government controlled traditional newspapers or news channels. In this age of Facebook/Twitter, we do our own publicity !! We do not depend on donations. RTI Anonymous was originally conceptualised as a self funding initiative. Any Donations are accepted with gratitude and as a mark of appreciation, for our effort. Every single paisa goes to the filing of the RTI’s. UNTOUCHABLES: Three pillars of RTI Anonymous, Anand Sharma, Avnish Singh & Ritesh Singh !!! The sad thing is the univeristy is still issuing these degrees and if you read thru the entire post — you would see how many students & people have been cheated here . 3) Corruption at Road Construction of Ghorakpur – Gopalgunj Section, LMNHP -9. 7) RTO Offices all over Uttar Pradesh is coruption Free.